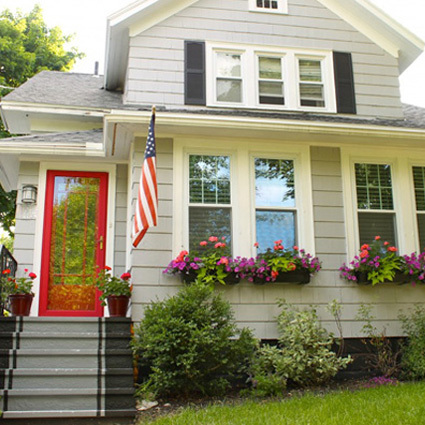 If your front-facing outdoor space leaves you yawning, these 3 inexpensive paint ideas will perk up your curb appeal. Think your exterior entryway lacks zing? Is your plain garage door a bore? Be bored no more with these budget-friendly painting projects. Dana from Bella Tucker wasn’t fond of her dowdy front porch with a cold cement floor. Several coats of fresh paint later, she says she “grins like a goofball” each time she turns into her driveway. Her statement-making painted floor is the showstopper in this porch makeover. How did she create the Moroccan-inspired pattern? She used a stencil to create a repeating pattern. Dana shares the process behind the eye-popping design here. Tip: Practical features can be pretty, too. Dana also updated the porch’s lighting, added a clearly visible house number, and replaced the front door’s hardware. How do you add character to a builder-grade garage door? Eliesa from A Pinterest Addict created the illusion of a carriage door using paint and hardware. The faux windows and the fleur-de-lis accents cost her less than $40. How did she pull this look off? She used tape. She shares how she created the windowpanes in detail here. Tip: What’s the secret to creating clean, crisp paint lines? Frog tape. Eliesa said it’s better at stopping color bleed than conventional painter’s tape. When Jordan from the mother and daughter blog The 2 Seasons moved into her 1928 Craftsman-style house, she had to spring for a new roof and landscape. That didn’t leave enough coin to replace a major eyesore — her front steps. So she freshened them up with paint. But instead of painting them one solid color, Jordan pumped up her curb appeal by creating a faux runner. She explains the entire process from start to finish here. Tip: Jordan’s steps not only look better, they’re also safer. Before adding the final coat, she added sand to the paint mixture. The added grit makes them slip proof when it rains.